The idea of bendable phones before Samsung’s Galaxy Fold and Huawei’s Mate X seemed charade. Because over 10 years now since Apple showed its iPhone in 2007, other than better cameras, screens, or improved battery life, there haven’t been any substantial innovations. However, it seems 2019 is set to buck the trend. Tech giants like Huawei and Samsung unveiled phones that used to be a gimmick. And recently patents from Google, discovered by Patently Mobile, showed rough designs of Google’s foldable OLED panel. Does this make, foldable phones the next mobile frontier? As of now no one can predict what will be the future of foldable phones. Will it be another fad or future of smartphones? Whatever the outcome will be, unquestionably foldable phones made history. Foldable phones cradle of a new era or a cautionary tale? Whatever the case, story of bendable phones is exciting. Even in a niche market, there’s bound to be competition hence businesses need to look for diverse ways to segregate themselves and become a leader. 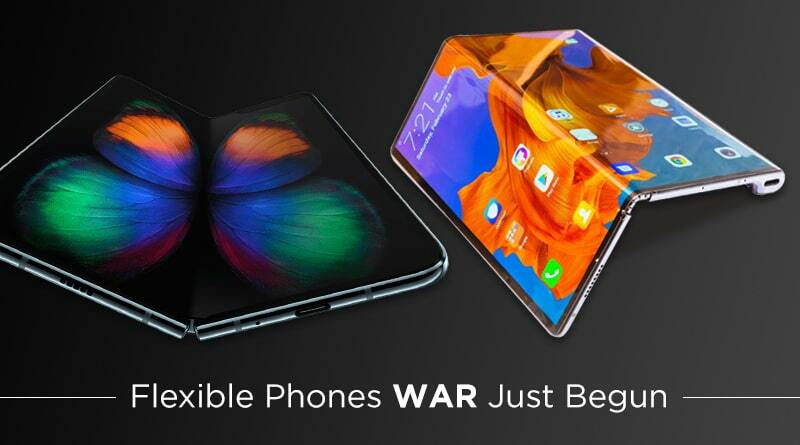 Therefore, companies like Samsung, Huawei and who knows who else are battling for foldable phone. An unknown Chinese firm called Royole released, first foldable screen FlexPai in October. After that came the tech giant Samsung, with its Galaxy Fold and made next landmark in the history of foldable phones. The device was well appreciated, and it fired the starting pistol. But its exorbitant price raised a few eyebrows. After this came Huawei with its Mate X, a phone with a foldable screen, 5G compatibility, front and rear camera, turbo fast charging. Then is Xiaomi joining the party with its Mi Flex. A phone that was introduced on Weibo (social media platform). Other companies rumored to join the rate race are: Apple, Google, Lenovo, LG, Motorola, Oppo, TCL. This clearly shows companies are exploring this idea. If bendable phones are able to make a mark, you can expect Google and Apple to eventually join the race. Now that you have an idea about companies bringing foldable phones. It’s time to understand need, pricing, durability and other aspects of bendable phones. Do we need foldable phones? Why is there a hype? Samsung at its annual developer’s conference explained this very smartly, when opened it’s a tablet with a bigger screen, whereas when closed it’s a phone. In a world driven by screen sizes everyone wants to have a device with bigger screen. Hence foldable screens are designed. The trio Huawei, Samsung, and Royale were first to debut foldable phones and the way their efforts were acknowledged and appreciated. For me Foldable phones are here to stay. If that’s the case, why Apple the trigger company is absent here? To my judgment, this speaks about the capabilities, self-confidence and assurance of other companies than it says anything about Apple. Another interesting here is neither Google nor Apple produces display and handsets on its own. Both companies outsource manufacturing of their device. This means we won’t have foldable phones from Google and Apple soon. They will take time to see the light of the day. How important are foldable phones for companies? Perceptibly, foldable phones are important for the future of Android, and it appears Google too is interested. Hence the company is adding foldable display support into Android’s latest version i.e. Android Q. As announced these devices will cost a fortune, therefore they need to be durable. This means their durability in respect to repeated folds is looked upon for. Samsung’s Galaxy Fold is rated to survive “hundreds of thousands” of folds but at the end of the day it’s just a plastic screen. So, we will need to wait and watch to see if bendable phones are more of a fancy sleeve than any kind of reliable armor. Should You Buy a Foldable Phone? Soon, a day may come when the only type of phone you’ll buy is foldable. The tech seen so far is a glimpse into the forthcoming future and with this question, should you buy a foldable phone now definitely arise? As per my judgment being an early adopter of any tech doesn’t really pay. Because by being the first you’ll miss out on the bug fixes and advancements that will come with further iterations. Moreover, if you have up to $2,000 spare you can surely buy Samsung Galaxy Fold and flaunt it. But for most waiting for the foldable tech is a smart choice. Where manufacturers like Samsung, Huawei, Oppo, Xiaomi, Lenovo and others are battling for foldable phone. LG one of the pioneers in flexible displays think it is too early to introduce foldable smartphone. Instead of releasing foldable phone it has launched a rollable TV i.e. one step ahead of foldable technology. Plus, Foldable phones may be the mainstream soon but to begin with there are certain foreseeable problems that needs to be dealt with like convincing consumers that flexible phones are worth the hefty price tag. With this you now know where different companies stand when it comes to flexible phones. Surely, in two years’ time you’ll see improved foldable phones, screen protectors that can stretch and flex. And the price of bendable device is also expected to dip. Because companies won’t be able to manufacture these devices in bulk. But what about us, (users). What do we think about it? Please share your thoughts in the comments section below. If you like the article do share and let us know if we missed out on any details. Stay tuned to see what comes next.